NEWPORT BEACH — Billy Dutton and Mark Ward are getting ready to cruise 354 miles down the coast — with a pre-cruise stop at the Lido Yacht Expo, Sept. 27-30 — to raise awareness about the health of the Pacific Ocean. They plan to make the 13-leg trip in a 22-foot solar-powered Duffy electric boat. Friends since college, Dutton and Ward were stand-up paddleboarding in a Southern California harbor two years ago when Dutton noticed a problem. “We were astounded by the amount of trash floating around,” Dutton said. For the next few hours, the two scooped up as much floating debris as they could fit on their boards. They realized this was a larger problem that would require more than one day on the water to solve. Today, Dutton, 52, and Ward, 46, have put together a mission aimed at raising awareness about Southern California’s most important resource: the ocean. With a mission dubbed “Riding Currents,” the two have planned an “electric surf safari,” taking a 22-foot solar-powered Duffy electric boat from Santa Barbara to Ensenada, surveying the health of Southern California’s marine ecosystem along the way. “Like many things, this project is the result of a few separate events,” said Dutton, a Newport Beach native who met Ward while attending Arizona State University. After their trash-filled paddleboard day, Dutton and Ward — both surfers — were asked by a friend who was looking to purchase a Duffy electric boat in Long Beach Harbor to check out the boat for him. He wanted to get it down to San Diego, but he wasn’t sure how to go about doing it. That’s when the two started to discuss the idea of traveling down the coast, going from port to port, and recharging the electric vessel’s batteries each night for the next leg. “A Duffy is, far and away, our favorite boat — and to go on a 350-mile open-water surfing safari in a boat everyone else dares only to sip wine and crawl around the safe confines of a harbor in … well, something about that just appeals to us,” Dutton explained. They first spotted their boat lying dust-covered outside the Duffy Electric Boats offices in Newport Beach. “When you have a boat company for 40 years, I guess you might find yourself with a few extra boats,” Dutton said. They worked to refurbish the 22-foot vessel, and named it Riding Currents. The boat has a modified surrey structure that holds four solar panels, and tucked under them are two bamboo standup paddleboards the two will use during their journey. An extra bank of Trojan T-145 batteries has been installed under the decks, giving the boat ample power for each day’s route. The team recently finished sanding off and applying a new bottom paint on the boat’s hull, and the vessel was christened Sept. 23 in Newport Harbor. Scheduled to set out from Santa Barbara on the morning of Oct. 8, Dutton and Ward will make their way down the coast, stopping at 11 harbors on the way — including one stop at Santa Cruz Island — and they hope to reach Ensenada by Oct. 19. The Riding Currents team includes landside support from operations manager Brady Hollingsworth, and crewmembers Eric Pyke and Chris Dawson. Together, the team will work to make sure Dutton and Ward enjoy a slow and steady trek down the coast at a leisurely 5 knots, tucking in each night at a different Southern California harbor to let the batteries recharge. At various points along the cruise, Dutton and Ward will be pulling trawls used by the Five Gyres Research Institute for collecting samples of floating debris. The team is also working with Heal the Bay, taking water samples at predetermined points, to assisting in monitoring water quality along the coast. In addition to the on-the-water research, the team will be visiting schools at each port to get across the message out about the dangers of plastic waste and its harm to the ocean. But the trip won’t be all business. They expect to find a few wave breaks during the trip. At the pace they will be going, there will be plenty of time for both research and leisure. The Riding Currents team and their 22-foot research Duffy will be on hand at this year’s Lido Yacht Expo at Lido Marina Village in Newport Beach, and team members will be on hand to answer questions about the boat and the mission. The boat will be on the docks for boat show-goers to see during boat show hours Sept. 27 and 28, from 3 p.m.-7 p.m. Sept. 29 and all day Sept. 30. 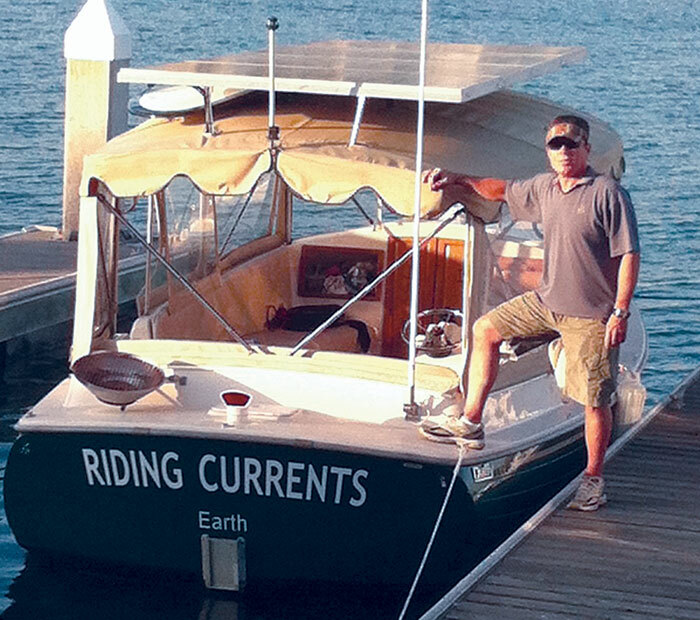 For more information on the Riding Currents voyage, visit ridingcurrents.com.